Managed by BEAM, the International School of Creative Science saw a record number of its students achieve top grades across both levels, in a spectacular display of academic excellence. Sharjah, 12 September 2018: The students at International School of Creative Science Muwaileh (ISCS Muwaileh) have once again recorded a set of stellar results at the recent Edexcel International General Certificate of Secondary Education (iGCSE) and Advanced Level (A-Level) examinations. 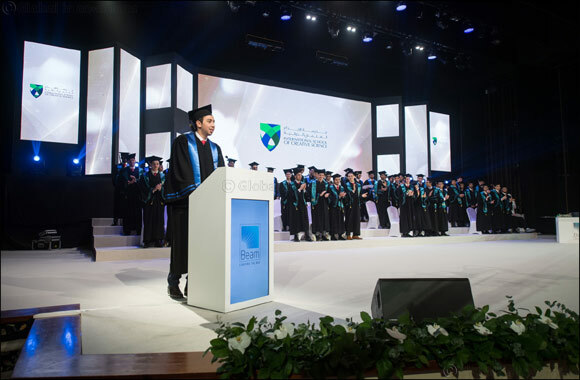 Over 80.85% of our students attained grades ranging from A*-B on the A2 Level examinations, a further increase from the school’s performance last year, where students accomplished exceptional achievements by attaining the highest marks across key subjects in the World, in the Middle East and in UAE. A total of 124 students appeared for the iGSCE examinations, including students from Year 11 as well as achievers from Year 10 who took one or more exam early. Analysis of the Year 11 results showed that 78% scored an A*-B grade across all subjects; with a whopping 100% A*-C pass rate in Arabic, English Literature and Further Pure Maths. The results have also proved to be considerably higher when compared to Pearson statistics for international iGSCE results, for cumulative scores across all subjects as well as individual subjects. Similarly, impressive results were seen amongst the 70 students who took the A-Level exams (AS & A2), with 57% and 81% of students attaining an A*-B grade at the Year 12 and Year 13 levels respectively. At the A2 Level, 100% of students secured grades of A*-B in Arabic and Further Maths, while results in Maths, Chemistry, Physics and Biology far exceeded international averages. Managed by Bukhatir Education Advancement & Management (BEAM), the International School of Creative Science Muwaileh (ISCS Muwaileh), Sharjah, was founded in 2002. It’s a faith-based learning school and offers a British K-13 curriculum founded on academic excellence in an engaging environment that fosters traditional values alongside modern curriculum learning, highly attentive tutoring, and superior facilities.